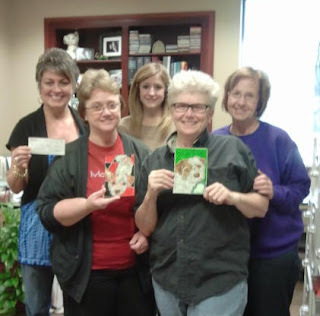 Because of last month's Dog Scratchin' book sales I was able to drop checks off to Fayetteville Animal Shelter and For Pets' Sake Springdale. I was absolutely giddy with delight! I wish I could say that I gave huge amounts of money, but it's a start. And as I know from working with these groups, every little bit helps. I am so happy to have been able to draw these dogs and tell their stories. Every day I hear really great feedback from someone who has read, or started to read the book. I love that. Making this book opened up a place in my heart that had been resting awhile. It wasn't closed off, or dormant, it was just waiting for the right time to wake up and get busy. Now that I've ticked that off the list, I'm working on the Cat Scratchin' project, which I hope to launch on kickstarter in January. A percentage of this month's proceeds will be going to Austin Pets Alive. I'll add up this weekend's sales at Eye of the Dog Art Center and then drop a check off on Monday. If you happen to be in the Austin, TX area, San Marcos is just a short drive away. Billy Ray and Beverly throw a really great show/party in a sweet country setting. Click on their link for directions and more information. And, oh yeah, Happy Happy Thanksgiving! I plan to eat a lot of good food with good people. And I will thank my lucky stars that I have such a fortunate life. Enjoy your day! Today I met up with the folks of "Fozzie" and "Libby". We had lunch and laughs, and even found out we knew several people in common...one of the things I have always really loved about Austin. If I don't say it enough, I want all to know how much I enjoyed drawing their dogs and telling their stories. It was and is an honor and priviledge (and really darned good fun). I love the connections. This time tomorrow night I will be signing books, handing out art work and "rewards" from the kickstarter project. Seeing old friends and meeting new. And...I hope raising a bit of dough for Austin Pets Alive! Of these two dogs, Fozzie is no longer around (but clearly was much loved by his folks) Libby is getting up in years, but still going strong. This is Mirabelle, also known as Monsterbelle. Reportedly she will be attending the book signing this Tuesday from 6-8pm at Wally Workman Gallery on W. 6th St. in Austin, Texas. I can hardly wait to meet new folks, their dogs and see old friends. I'll be distributing some of the artwork from the book to those who pledged at the kickstarter project, plus selling books and other artwork. I'm giddy with excitement. 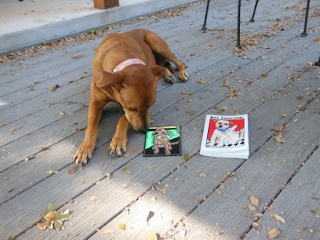 The other reason is that 10% of the sales will be given to Austin Pets Alive rescue group. Wally and Rachel are so kind as to not only host this event, but they are participating in the 10% donation. I love to be able to give to such great groups doing such great work. Today I also went to Kirchman Gallery in Johnson City, Texas for their holiday event. I met some super nice people and left some books there to sell. If you are in the Johnson City area on your way to the Hill Country you should stop by. They have a really great variety of art and artists in there..plus they also do wine tasting. The weekend after Thanksgiving I'll be out in San Marcos at Eye of the Dog Art Center at their home show, which is a truly special and fun event. I've been getting some really great emails from the folks who have received their books and artwork. This is Maggie with her original art. I think she likes it! What a sweetheart. Her story in the book is really dear. 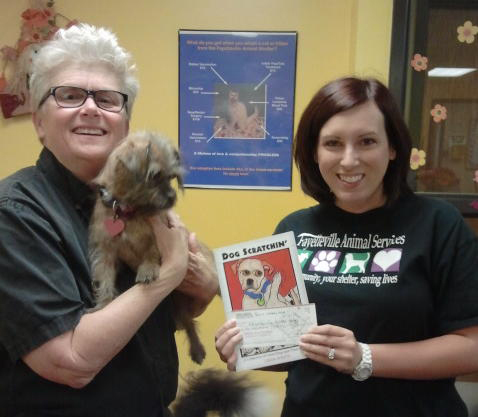 I'm happy to report I dropped off two checks last week, one to the Fayetteville Animal Shelter and the other to For Pets' Sake Springdale. I split 20% of October sales between them. It wasn't tons of money, but it was something. I was absolutely giddy with delight. I love spreadin' joy! Next Tuesday (Nov. 13th) from 6-8 I'll be at Wally Workman Gallery selling books and art and distributing rewards to kickstarter funders. Now Wally would tell you that I usually dash out the door during show openings if there are too many folks in the room. I promise I won't do that on Tuesday. I will hang in there with all y'all. A portion of the proceeds from the night are going to the Austin Pet's Alive rescue group, so let's fill the place and make some $$ for those great folks!